SAW009729 SCOTLAND (1947). 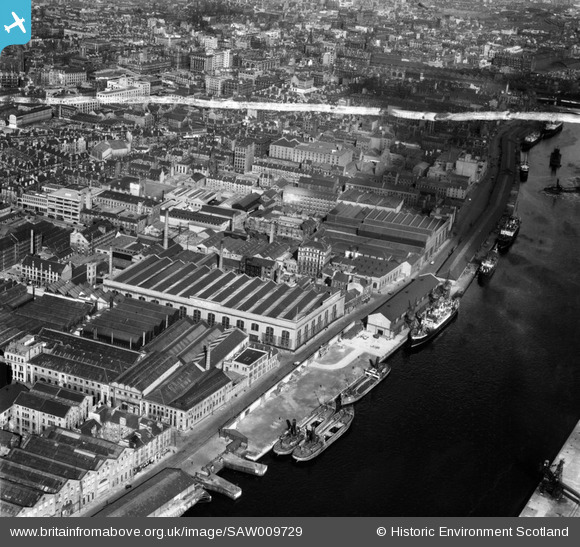 Glasgow, general view, showing Harland and Wolff Diesel Engine Works, 181 Lancefield Street and Anderston Quay. An oblique aerial photograph taken facing east. This image has been produced from a crop marked negative. Pennawd [SAW009729] Glasgow, general view, showing Harland and Wolff Diesel Engine Works, 181 Lancefield Street and Anderston Quay. An oblique aerial photograph taken facing east. This image has been produced from a crop marked negative. Arbuckle Smith Bonded Warehouse, Cheapside Street. Burns & Laird Lines TSMV "Royal Scotsman" or "Royal Ulsterman" on the Belfast night service. Burns & Laird Lines SS "Lairdshill" - normally on the Derry service.